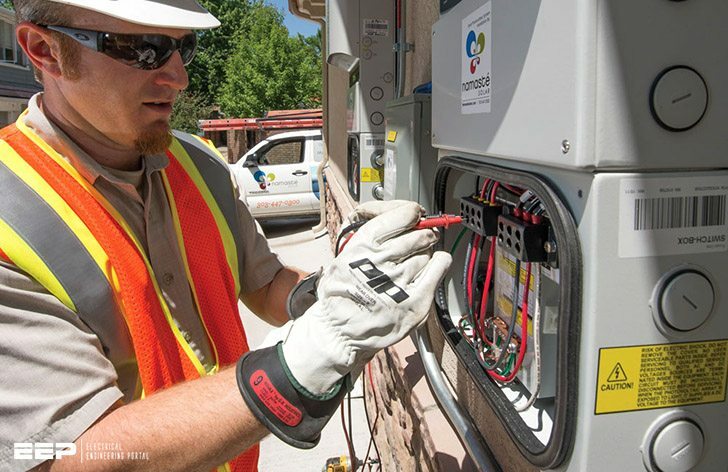 Proper system grounding is essential in protecting against transient overvoltages that result in significant damage to equipment and people working at the power substation. Currently, there are various system grounding principles that can be applied and are differentiated by the impedance or lack thereof between the neutral point of the three-phase system and ground. In a high-impedance grounded system a high resistance or inductance is inserted into the ground connection. This limits fault current levels or even negates system capacitance to largely eliminate fault current, respectively. Low-impedance and solidly grounded systems have relatively higher fault currents, but facilitate easier detection of ground faults due to voltage drop along the line. This project focuses on a system that has no intentional ground connection, known as an ungrounded system. Although there is no intentional ground connection the neutral is still coupled to ground via system capacitance. For a ground fault on an ungrounded system, the fault currents remain close to zero as the faulted phase voltage approaches the same potential as ground. The unfaulted phase voltages increase with respect to ground and resulting in an overvoltage condition. These properties lead to a unique method for detecting and protecting against ground faults for an ungrounded system. An example of an ungrounded system is shown in Figure 1 below. The secondary windings of the transformer are connected in delta configuration and the system feeds an ungrounded load. 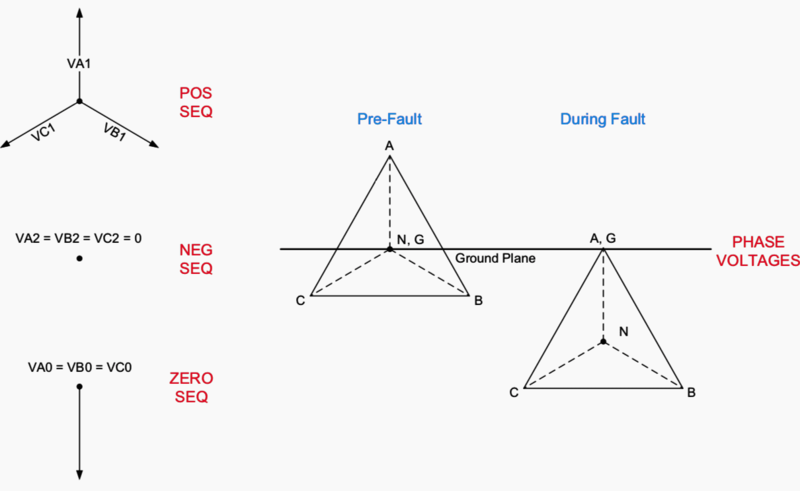 For a single line-to-ground fault, the sequence diagrams would be connected in series as shown. Since the delta-connected transformer represents an open circuit in the zero-sequence diagram, the only path for the fault current to flow through is the system capacitance. This impedance is very high relative to the series system impedances, so the fault current and negative sequence voltage approaches zero while the positive sequence (source voltage) and zero sequence voltages are equivalent. Since the fault current is low, a typical ground overcurrent relay is inefficient for detecting ground faults in an ungrounded system. 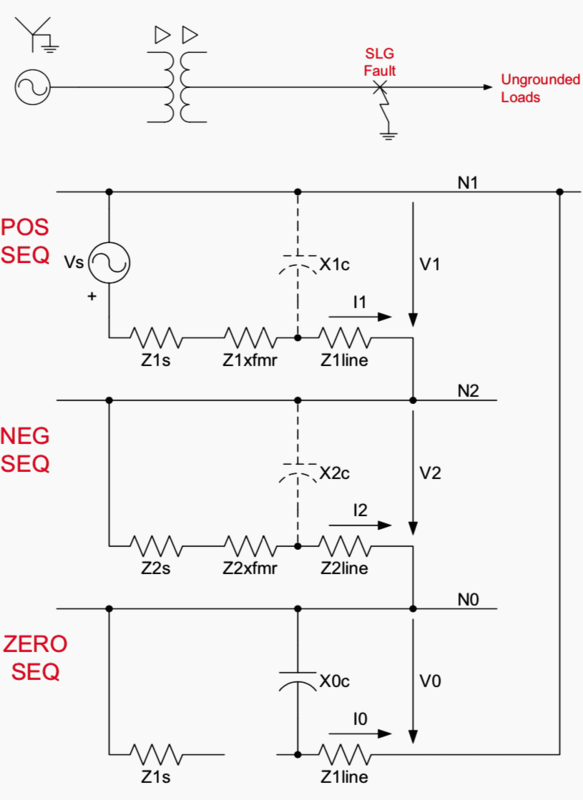 Instead, detection of overvoltage conditions must be relied on to indicate a ground fault. The sequence and phase voltages for a single line-to-ground fault in the same ungrounded system are shown in Figure 2 below. It can be observed that the faulted phase voltage collapses to zero at the fault while the unfaulted phase voltages increase to √3 times their original magnitude, equal in magnitude to the line-to-line voltages. Further, the angle between the two unfaulted phase voltages decreases to 60°. It is interesting to note that the phase-to-phase voltages remain unchanged, which facilitates the continued operation of ungrounded loads. However, the increased phase-to-ground voltages on the unfaulted phases predicate increased insulation levels versus a grounded system. Lastly, the phasor diagrams show that the neutral-to-ground voltage magnitude during a fault approaches that of the phase voltage under typical, unfaulted conditions.